Ever since I did the Cash Envelope blog post and the Guide to Being on A Budget post, I've received numerous emails and comments asking for a blog post about paying down debt. So here is my breakdown of how to do it, based on how I paid off mine. Step 1// Make Sure You Have an Emergency Fund. If you read the Dave Ramsey books, you will know that this is baby step 2, AFTER you have an emergency fund of $1,000. This is because in order to do Step 2 below, you must have a way to pay for things that come up. So how do you get $1,000 together? It sounds impossible doesn't it? You are already on a budget and inundated with debt, so how are you supposed to come up with even more money? Okay, ask yourself this.... if a loved one (partner, child, pet) was in an accident and the only way to save their life was to come up with $1,000 ASAP, could you do it? Yea, you definitely could. You could get a part time job, do odd jobs for people you know, or go on a selling spree on Craigslist and ebay. So why is this any different? I spent a couple months selling everything I could on ebay. The point of this fund is that whenever an emergency happens, you won't need to use your credit card because you'll have some extra money stashed. Also, if it's easier for you to come up with $500 that's fine too but just try to get it up a bit higher whenever you get a chance. Step 2// Stop Creating Debt. Once you have your emergency fund completed, you won't need to use your credit cards so put them away. Whether you have to cut them up, or lock them in a safe, make sure you no longer have access to them in the event of an impulse to spend. Step 3// Write Down What You Owe. I made an excel spreadsheet listing every single debt I had including, personal loans, cars, credit cards, etc. Step 4// Choose The Order. Some people say it's best to pay off your debts in order of the highest APR, but for me that never worked. See I had so many different credit cards with minimum payments that were anywhere from $65-$200. So even though it would have been nice to have one less payment of $200 each month, I knew it would take forever to pay off that card. So I decided to pay off the smaller ones first since they ended up being paid off quicker. It actually worked better this way, because all my life I tried the other way. So you can do as you wish, but just find the system that works best for you. So say you are paying card 1 off first, and you have $100 extra leftover each paycheck or each month. You would pay that $100 plus the regular minimum payment you already budgeted for ($50). Now, let's say you pay off Card 1 in a couple months, you will take the $150 you'd been paying on it, and add that to Card 2's $50 payment. So that means you are paying $200 every month on Card 2. Once that's paid off, you will add $250 to Card 3's minimum payment. See how it works? Now, for those of you that are about to comment below screaming at me that this is impossible because you don't even have enough money to pay all of your bills and credit cards.... you will have to try and figure out a way to either lower your monthly expenses of increase your monthly income. Whether that's getting a new job, or what. 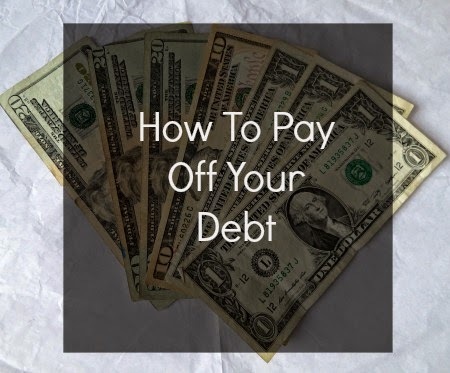 I'm sorry I can't be of more help for that but this post was simply to explain the debt snowball payoff process. 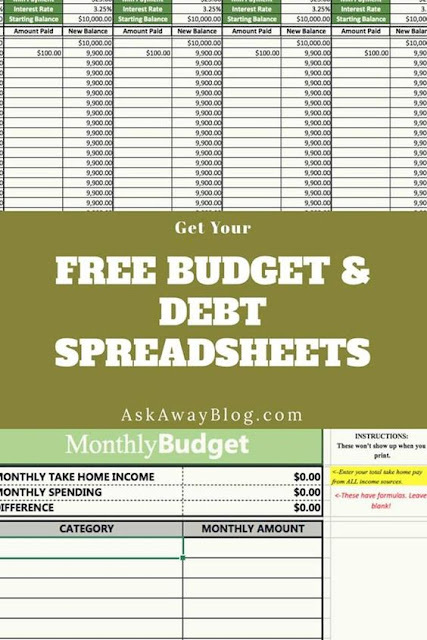 Make sure you get your free financial spreadsheets here and check out my book on Amazon! These are great tips! I definitely agree that it's really important to stop incurring more debt while trying to get a handle on your existing debt. Yep you gotta break the cycle at some point! Thanks for stopping by to read! I completely agree that you should start paying off the credit cards with the least amount owed on them first. It is much faster and then like you said, when they are paid off, you add what you were paying monthly for that card to the next card that needs to be paid off. The credit card that I had paid off (but now it isn't paid off anymore since I had hardly any money in my emergency fund and had to use credit cards to fix my car) was the card I owed the least amount of money on but had a really high interest rate. So it only made sense to pay that one off first. Yea its just what worked way better for me!